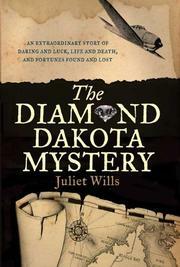 Real-life adventure about a fortune in diamonds, gone missing during World War II. Australian television journalist Wills does a good job of setting the initial scene. Fleeing the Japanese invasion of Java, a seaplane piloted by World War I Russian ace Ivan Smirnoff was shot down by marauding Japanese Zeros. Beached on the remote northwest Australian coast, Smirnoff, his three-man crew and eight passengers struggled desperately to survive for days with little food or water; several died, including a young mother and infant. They had no time to worry about the disappearance of a mysterious parcel handed to Smirnoff shortly before takeoff, especially since none of them knew it contained thousands of diamonds from a Dutch-owned Java bank. Jewelers David Davidson and his brother-in-law Willy Olberg had fled from their homes in Amsterdam to Java after the Nazis invaded the Netherlands; when the Japanese did the same in Java, they hoped to get the diamonds to safety in Australia. Several weeks after the survivors were rescued, a crusty beachcomber named Jack Palmer scoured the wreckage and found the diamonds. Before long, he shared his secret with others, word got around, and the police began investigating. Wills certainly manages to whet our appetites with this heady mix of greed and courage, but her sketchy and occasionally slapdash narrative leaves the nagging feeling that we’re not getting the full story. Particularly in its latter half, the book feels rushed and abrupt; central characters like Palmer, Jim Mulgrue and Frank Robinson (all eventually charged with the theft) are little more than stick figures. Nor do we ever get a feel for life on the remote Australian coast, where the Japanese made several tentative stabs at invading the continent.